Chana dal sundal recipe. Chana dal gugri. It is known as 'kadalai paruppu sundal' in Tamil and 'kadale bele gugari / ghugari' in Kannada. 'Split chickpeas' or 'Chana dal' is also known as 'bengal gram dal'. It is known as 'harbhara dal' in Marathi, 'kadale bele' in Kannada. Chana dal is made from the split kala chana(black or dark brown chickpeas), desi chickpeas. It is a south Indian festival recipe made in Karnataka, Tamilnadu. It is great as a snack at any other time too. During the Ganapati festival as well as during the 10 day dasara festival and other festivals, a variety of sundal / ghughri is made. Sundal is a South Indian traditional dish and is usually made with lentils/pulses. Sundal is offered as 'Naivedya' to the deity and then distributed to the devotees as prasad. 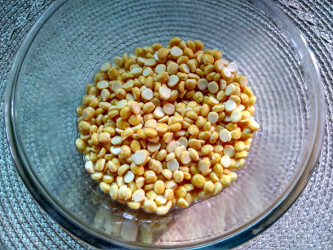 This chana dal sundal is one of the items made as naivadyam. 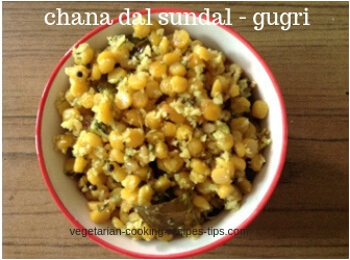 For this chana dal sundal recipe given below, you use dry chana dal for this recipe. Though there is some soaking time is involved, the cooking is quick. Put chana dal in a bowl and add water to cover dal. Wash 2 times. Add water to cover chana dal. Soak chana dal for 2 hours. 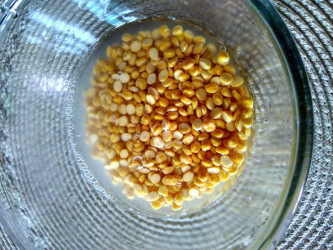 Chana dal in the image below is soaked for about 2 hours. Add dal along with water to a pan. Add a 1/4 tsp salt and bring to boil. Add some more water if needed. Boil dal till it is just done. It should not break. Drain dal after it is just cooked. Keep the water aside to use if necessary. Heat oil in a pan. Keep heat low. Add hing (asafotida), curry leaves, chopped chilies. Add boiled chana dal. stir to mix. Add all the other ingredients, coconut. Add a table spoon of reserved water if needed. Add lime juice, chopped coriander leaves (cilantro) and mix well. Chana dal sundal / kadale parapu sundal is ready. Serve hot or cold. You can refrigerate and use for 3-4 days. It is good to eat at a snack or as a side dish for any meal. You may add desiccated coconut instead of fresh grated coconut. Traditionally, small coconut pieces are added to sundal or ghugari. You may add some chopped ginger or ginger paste.